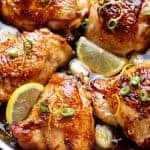 Juicy Honey Lemon Garlic Chicken with a crispy skin and a sweet, sticky sauce with ingredients you have in your kitchen cupboard! Pan fried first to get that crispy skin, then baked to cook them all the way through, this is one of those chicken dinners you'll be forgiven if you make it once a week. Plus, the optional bonus of making more sauce on the stove top, until it thickens and caramelises in its special honey way, for extra drizzling to serve. In a large mixing jug, whisk together the honey, lemon juice, soy sauce, vinegar and minced garlic. Pour about 1/4 cup of the sauce over the chicken (or just enough to lightly coat each thigh) and rotate each thigh to coat evenly in the sauce.